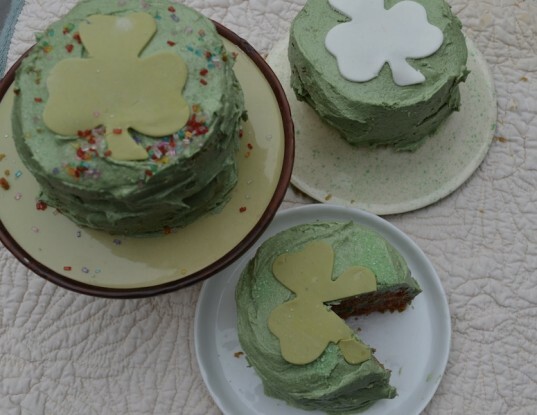 I had been toying with making a layered vegan cake with green frosting for St.Patrick's Day when I realized it would be much more fun and festive in a mini-version, as if made for leprechauns. My kids loved the pint-sized version so much, they didn't even mind sharing! 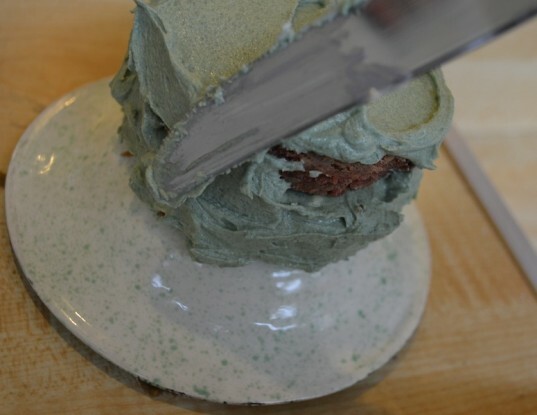 We used a vegan recipe for the frosting and the batter and dyed them green. However, there must have been leprechauns making mischief in my kitchen because the batter went into the oven green and came out red! In any case, no one in my family minded. To make a more dramatic contrast, you could also just color the frosting and keep the batter plain and undyed. Make sure to use natural food coloring for your cake batter and frosting from a brand such as India Tree or Chocolate Craft Colors. These brands use vegetable and fruit extracts instead of chemicals to yield a healthier way to color your creations. Read on for a sweet St.Patrick's Day treat and find one-page, printable directions here. Both recipes slightly adapted from Vegan Cupcakes Take Over the World. Line two 8 by 8 inch baking pans with parchment paper and preheat the oven to 350 degrees. In a small cup, mix together the non-dairy milk and apple cider vinegar and set aside for a few minutes. Meanwhile, in a medium bowl, mix together the flour, cornstarch (or potato starch), baking powder, baking soda, and salt. In a large bowl, cream the Earth Balance and sugar together until well-combined and fluffy, about 2 minutes. 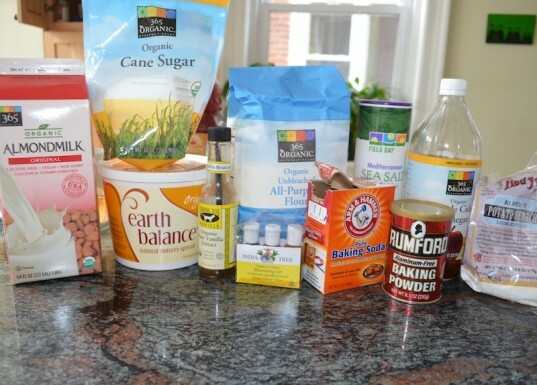 Add in the vanilla extract and then take turns adding in some of the non-dairy milk mixture and the dry ingredients. Finally, beat in the food coloring, a few drops at a time. 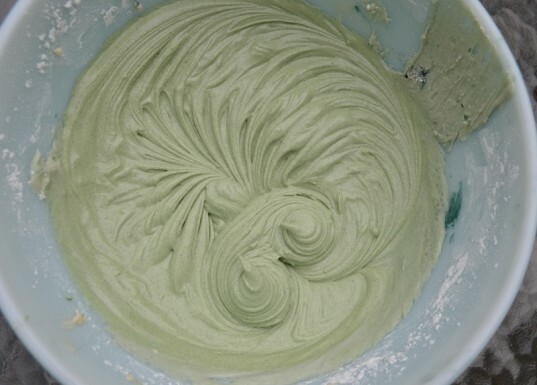 Beat or mix until well-combined, adding more food coloring until desired color is achieved. Pour half the batter in each of the baking pans and bake for about 20 minutes. Let cool completely. Beat the margarine until fluffy. Beat in the powdered sugar gradually until desired sweetness is achieved (I usually use about 2 3/4 to 3 cups of confectioner’s sugar). Add the food coloring and spirulina (if using) a bit at a time. Beat for another few minutes once you have achieved the green color you want, so that the frosting will be nice and fluffy. Use immediately or refrigerate until needed. I dyed white fondant using the same food coloring drops. Simply add a few drops and knead the color into the fondant. Then roll the fondant out with a rolling pin and cut out whatever shapes or designs you would like. 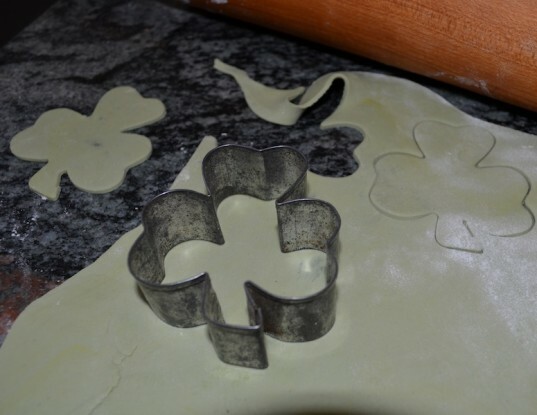 We had a clover cookie cutter so I used that, but you can also make a leprechaun’s hat. Or dye the fondant yellow and cut it into the shape of a pot of gold. Once the cakes have cooled completely, lift up the parchment and place the cakes on the counter. Using a round cookie cutter or an upside down glass, cut the cake into desired shape. Using a standard glass, I was able to get 4 cake rounds out of each baking pan (so 8 total). Put cake round on desired serving plate and frost. Add another cake round and repeat. I made one 3 layer leprechaun cake and three 2-layer cakes, but you can also do the reverse or even make two really tall 4-layer cakes. Top the leprechaun cake with decorations such as fondant or sprinkles. Serve to your little leprechauns. My kids split a 2-layer cake. This recipe made 8-10 total servings. Enjoy! Gather the ingredients. First make the cake. Line two 8 by 8 inch baking pans with parchment paper and preheat the oven to 350 degrees. In a small cup, mix together the non-dairy milk and apple cider vinegar and set aside for a few minutes. Meanwhile, in a medium bowl, mix together the flour, cornstarch (or potato starch), baking powder, baking soda, and salt. In a large bowl, cream the Earth Balance and sugar together until well-combined and fluffy, about 2 minutes. Add in the vanilla extract and then take turns adding in some of the non-dairy milk mixture and the dry ingredients. Finally, beat in the food coloring, a few drops at a time. Beat or mix until well-combined, adding more food coloring until desired color is achieved. Pour half the batter in each of the baking pans and bake for about 20 minutes. Let cool completely. Then make the frosting. Beat the margarine until fluffy. Beat in the powdered sugar gradually until desired sweetness is achieved (I usually use about 2 3/4 to 3 cups of confectioner’s sugar). Add the food coloring and spirulina (if using) a bit at a time. Beat for another few minutes once you have achieved the green color you want so that the frosting will be nice and fluffy. Use immediately or refrigerate until needed. Next, make the decorations. I dyed white fondant using the same food coloring drops. Simply add a few drops and knead the color into the fondant. Then roll the fondant out with a rolling pin and cut out whatever shapes or designs you would like. We had a clover cookie cutter so I used that, but you can also make a leprechaun’s hat. Or dye the fondant yellow and cut it into the shape of a pot of gold. Then assemble the leprechaun cakes. Once the cakes have cooled completely, lift up the parchment and place the cakes on the counter. Using a round cookie cutter or an upside down glass, cut the cake into desired shape. Using a standard glass, I was able to get 4 cake rounds out of each baking pan (so 8 total). Put cake round on desired serving plate and frost. Add another cake round and repeat. I made one 3-layer leprechaun cake and three 2-layer cakes, but you can also do the reverse or even make two really tall 4-layer cakes. 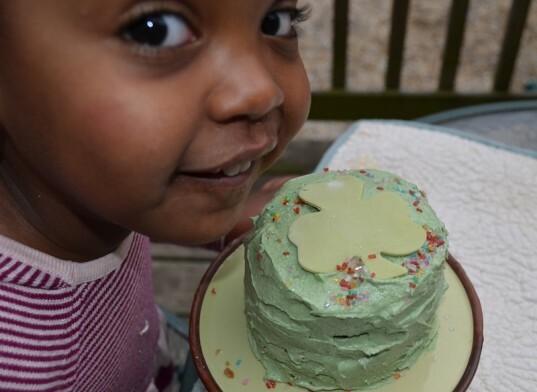 Top the leprechaun cake with decorations such as fondant or sprinkles. Serve to your little leprechauns. My kids split a 2-layer cake. This recipe made 8-10 total servings. Enjoy! Happy St.Patrick’s Day! Beat the margarine until fluffy. Beat in the powdered sugar gradually until desired sweetness is achieved (I usually use about 2 3/4 to 3 cups of confectioner's sugar). Add the food coloring and spirulina (if using) a bit at a time. Beat for another few minutes once you have achieved the green color you want, so that the frosting will be nice and fluffy. Use immediately or refrigerate until needed. I dyed white fondant using the same food coloring drops. Simply add a few drops and knead the color into the fondant. Then roll the fondant out with a rolling pin and cut out whatever shapes or designs you would like. We had a clover cookie cutter so I used that, but you can also make a leprechaun's hat. Or dye the fondant yellow and cut it into the shape of a pot of gold. Once the cakes have cooled completely, lift up the parchment and place the cakes on the counter. Using a round cookie cutter or an upside down glass, cut the cake into desired shape. Using a standard glass, I was able to get 4 cake rounds out of each baking pan (so 8 total). Put cake round on desired serving plate and frost. Add another cake round and repeat. I made one 3-layer leprechaun cake and three 2-layer cakes, but you can also do the reverse or even make two really tall 4-layer cakes. Top the leprechaun cake with decorations such as fondant or sprinkles. For the cake: 1 cup non-dairy milk 1 tsp apple cider vinegar 1 1/4 cups all-purpose flour 2 tablespoons potato starch or cornstarch 3/4 tsp baking powder 1/2 tsp baking soda 1/4 tsp salt 1/2 cup Earth Balance (or other vegan margarine), softened 3/4 cup granulated sugar 1 tsp vanilla extract yellow and blue natural food colorant For the frosting: 1 cup Earth Balance (or other non-hydrogenated vegan margarine) 2 1/2-3 1/2 cups confectioner's sugar yellow and blue natural food colorant up to 1 1/2 tsp spirulina (optional) For the decorations: fondant yellow and blue natural food colorant sprinkles, sanding sugars, green candies, etc Gather the ingredients. First make the cake. Line two 8 by 8 inch baking pans with parchment paper and preheat the oven to 350 degrees. In a small cup, mix together the non-dairy milk and apple cider vinegar and set aside for a few minutes. Meanwhile, in a medium bowl, mix together the flour, cornstarch (or potato starch), baking powder, baking soda, and salt. In a large bowl, cream the Earth Balance and sugar together until well-combined and fluffy, about 2 minutes. Add in the vanilla extract and then take turns adding in some of the non-dairy milk mixture and the dry ingredients. Finally, beat in the food coloring, a few drops at a time. 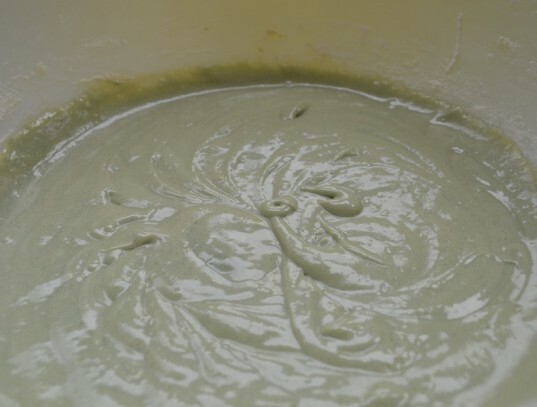 Beat or mix until well-combined, adding more food coloring until desired color is achieved. Pour half the batter in each of the baking pans and bake for about 20 minutes. Let cool completely. Then make the frosting. Beat the margarine until fluffy. Beat in the powdered sugar gradually until desired sweetness is achieved (I usually use about 2 3/4 to 3 cups of confectioner's sugar). Add the food coloring and spirulina (if using) a bit at a time. Beat for another few minutes once you have achieved the green color you want so that the frosting will be nice and fluffy. Use immediately or refrigerate until needed. Next, make the decorations. I dyed white fondant using the same food coloring drops. Simply add a few drops and knead the color into the fondant. Then roll the fondant out with a rolling pin and cut out whatever shapes or designs you would like. We had a clover cookie cutter so I used that, but you can also make a leprechaun's hat. Or dye the fondant yellow and cut it into the shape of a pot of gold. Then assemble the leprechaun cakes. Once the cakes have cooled completely, lift up the parchment and place the cakes on the counter. Using a round cookie cutter or an upside down glass, cut the cake into desired shape. Using a standard glass, I was able to get 4 cake rounds out of each baking pan (so 8 total). Put cake round on desired serving plate and frost. Add another cake round and repeat. I made one 3-layer leprechaun cake and three 2-layer cakes, but you can also do the reverse or even make two really tall 4-layer cakes. 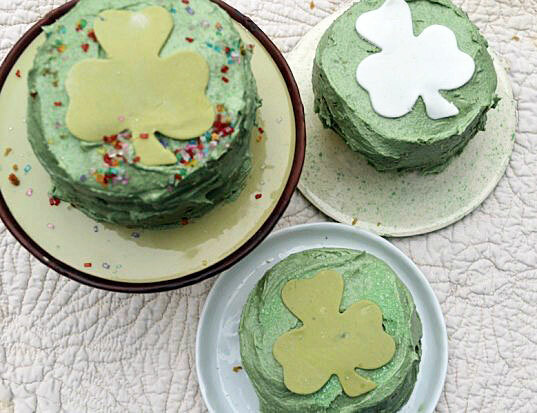 Top the leprechaun cake with decorations such as fondant or sprinkles. Serve to your little leprechauns. My kids split a 2-layer cake. This recipe made 8-10 total servings. Enjoy! Happy St.Patrick's Day!